The adjustable column has 3 preset heights 30", 36", and 42". The table easily knocks down into 3 pieces while not in use. The 3 heights allow you to use it for dining height, bar/cocktail height, and also 36" height. All top colors have a black edge, except for white. 24" Table Weight 16 lbs. 30" Table Weight 20 lbs. 36" Table Weight 26 lbs. 30" height is most commonly used as a small banquet dining table for 2-4 people. The 36" height has so many unique uses. Many people use the 36" height for display, and also standing height stations at trade shows. 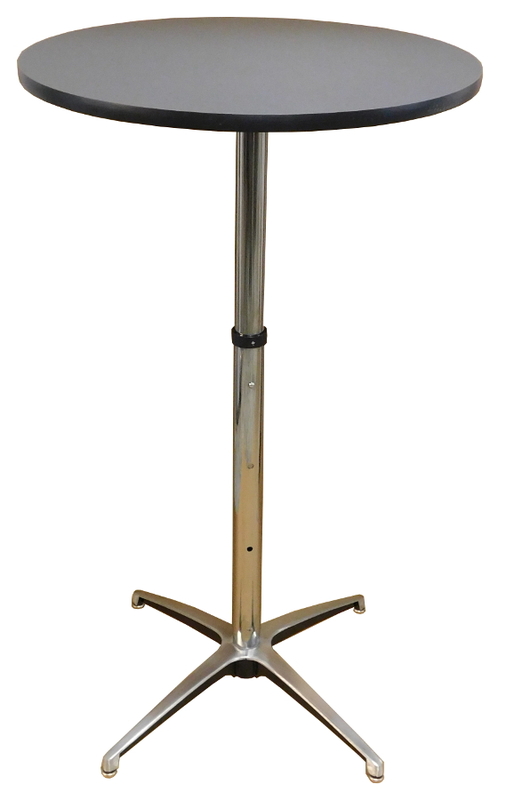 The 42" height is most used for cocktail parties.